The viral marketing campaign is a new approach from Ford Australia as it aims to stimulate sales of its slow-selling Falcon, which is now available with a new 179kW/353Nm 2.0-litre turbocharged four-cylinder petrol engine. Posted on the company’s Facebook page yesterday, the video shows two cane toads talking on a road and noticing an oncoming car. Guessing it’s a slow four-cylinder car, one quips they have ample time to get off the road. But the Falcon’s unexpected performance leaves the confident cane toad worse for wear and his friend covered in blood and guts. Ford says the video has resonated well online, with no official complaints made thus far. The advertising is not intended for television. 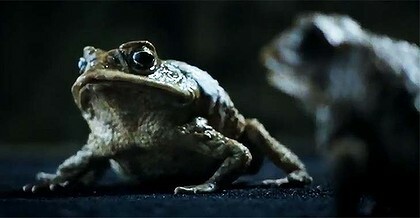 No cane toads were harmed in the making of the video, despite the species being generally recognised as pests by the Australian government. Instead, specially designed robotised puppets were used at a rumoured cost of $8000 each. According to the latest official sales figures, Falcon sales are down by 25 per cent this year, recording little more than 1000 sales in April, for a total of 4407 so far. Holden also suffered similar results, netting 2248 sales of its rivalling Commodore large car, or 10,596 sales year-to-date. By contrast, the popular Mazda3 small car almost sold their combined figure recording a little more than 3000 sales (14,601 sales year-to-date). Ford spokesman Neil McDonald says the toad ad is an attention grabber. “The idea is to push people to our website and to start talking about the EcoBoost,” McDonald says. “At the launch we made it very clear that this particular vehicle is a case of getting bums on seats. Cane toads were introduced to Queensland from Hawaii in 1935 in an unsuccessful attempt to control cane beetles that were killing sugar cane crops. It adapted well to Australia’s environment, however, spreading to the Northern Territory and New South Wales thanks to rapid breeding and no natural predators. In addition to threatening natural ecosystem, cane toads have a significant impact on the Australian economy, according to the Department of Sustainability, Environment, Water, Population and Communities. To date, the federal government has committed $2 million to the management of cane toads. Can you post the link to the ad? the new model may get the name-the toad,or toad killer,not the image they wanted,but may be a winner.time will tell.how does it stack up to imports,price and performance wise? Last edited by hans hartman on Fri May 04, 2012 7:43 pm, edited 1 time in total. the new new model may a get the name-the toad,or toad killer,not the image they wanted,but may be a winner.time will tell.how does it stack up to imports,price and performance wise? kinda disturbing haha, hopfully they make some adverts for tv. At least they've got some advertising for the ecoboost.